Detail of Dad’s House (2012). 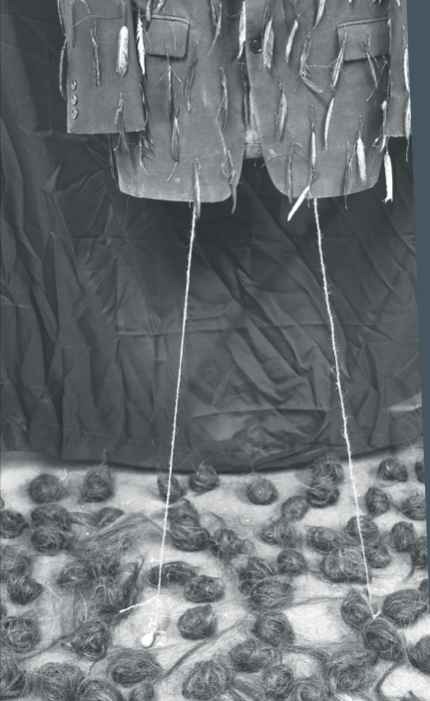 Installation with horse hair, feathers, cotton cloth, Photo by Clarissa Rose Pepper. What do you remember about where you grew up? About your family when you were young? C. Maxx Stevens, an artist of the Seminole/Muscogee Nation of Oklahoma, answers these questions for herself (and us) in the evocative show, House of Memory, in its final weeks at the Customs House at the Smithsonian’s National Museum of the American Indian in New York. 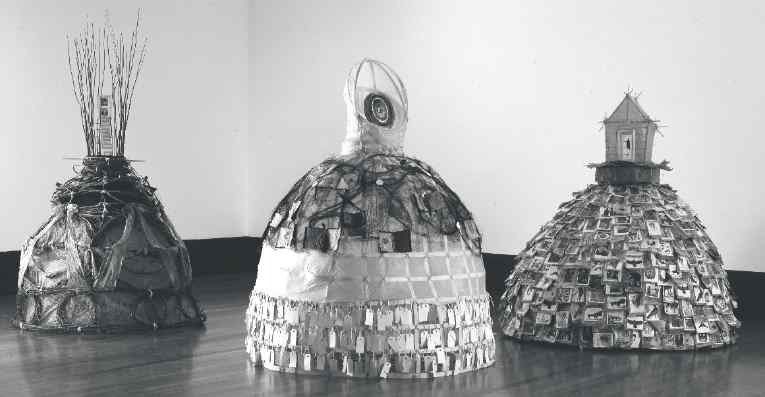 Stevens, currently teaching art at University of Colorado-Boulder, scrounges around in junk stores and yard sales out west to find the ephemeral materials for her installations – slightly transparent gauze made into hoop-skirt structures and large multimedia recreations of 1950s homes with floating scrims. Can you see through the haze? 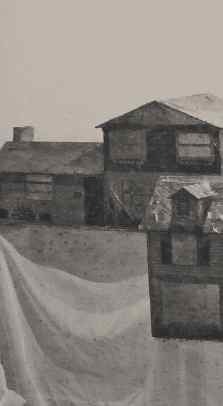 The experience of walking around the show takes you back to corners of Stevens’ memory growing up in a multitribal community of Plainview, Kansas, just outside Wichita. It may not be like your own experience, but the stuff she weaves, scatters, and constructs will cause you to tap into your own memories. The first gallery with The Three Graces is a tribute to her relationships with her sisters, and a must-see for lovers of fabrics, textiles, and interwoven mixed media. The second gallery has several installation that resemble mini-stage sets that trigger memories through scattered photos, altered clothing, suspended objects, horse hair, garden stakes, and evocative combinations of other props – Dad’s House, Mum’s House, Sister’s House, Four Directions House, and House of Transitions. Cultural Landscape is an immersive installation with tiny illuminated homes (found in thrift stores), scrims, and multimedia that “remembers” the 1950s streets of her suburban Kansas community. The Smithsonian chose to publish black-and-white photos of the installations, which we’re using here. It’s kind of fitting…not quite of-the-moment and a little back-in-time feeling. Want to reflect more about your own childhood home, your grandparents, and your neighborhood? Take a trip down to the Customs House before June 16, and let Stevens take you on that journey. NMAI is making the leap into downloadable digital media with this show, so go to the iTunes U store, type in “NMAI-NY” and download the app, which contains an audio guide for this show. If you’d prefer to read about Stevens and her work, download the PDF. This entry was posted in Art, History, Museums and tagged art, culture, drawing, museums, painting, textiles by mssusanb. Bookmark the permalink.